When you send emails, your recipients might read them on a computer, tablet, or phone—or more likely, all three. However your message might look different on all these devices. Later this month, you’ll be able to use CSS media queries with Gmail and Inbox by Gmail to ensure that your message is formatted the way you intended, whether it's viewed on a computer, a phone in portrait mode, or a tablet in landscape mode. You’ll be able to change styles based on width, rotation, and resolution, allowing for more responsive formatting to optimize your email for every device. You can find the full list of supported CSS rules in the developer documentation. We hope this reference helps you create more feature-rich, responsive email for users. Happy formatting! Guest post by Rich Manalang, Partner Engineering Lead at Atlassian. Posted by Wesley Chun, Developer Advocate, Google Apps. Atlassian has been building collaboration software for over 14 years. With products that include JIRA, Confluence, Bitbucket, and HipChat, our organization has learned a lot about how teams work effectively. HipChat launched the Connect API in November 2015, and since then we’ve continued to build upon our ecosystem of integrations and collaborations. 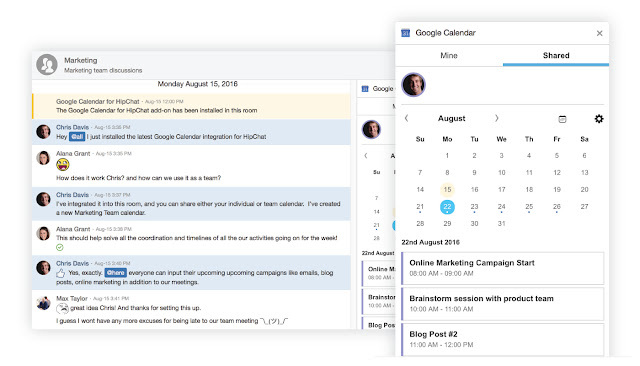 A few months ago, our team looked at potential integrations that would be a perfect marriage with HipChat — and today, we’re excited to share the Google Calendar and Google Drive integration for HipChat. Millions of people use Google’s products everyday, so we instantly knew this was the right opportunity. Many of HipChat’s customers are developers, and they told us that managing time and better access to files were two of the most important things in their day-to-day. Now with Google integrations available inside of HipChat, there’s no need to launch another browser tab or app. By building Google Calendar directly into HipChat, we’re improving the signal-to-noise ratio on a daily basis. Before this integration, we all dealt with context-switching between apps and browser tabs. Now, customers can use HipChat to view and share various calendars, schedules and important dates in the right sidebar. Our customers spend their entire working day inside our HipChat app — unlike email, you don’t just fire it up and quit periodically. So naturally, having your calendar up-front is compelling. And what’s more, you can slice and dice which ones you see on a per-room basis. Say you’re a program manager — if you go into the Engineering HipChat “room,” you can see the Engineering and related calendars. Then, when you switch into the Marketing room, you may see different calendars depending on whom you’re collaborating with. Having dual calendars front and center within HipChat is critical for staying on top of my work. I’m personally very excited about the Google Calendar integration because it’s one of the most important apps I use day-in and day-out. As a single parent with two kids busy at school, I need to know everything that's going on. My calendar is stacked, and I want to see it all at a glance. That urgency is similar when considering the most important documents in someone's daily workflow. 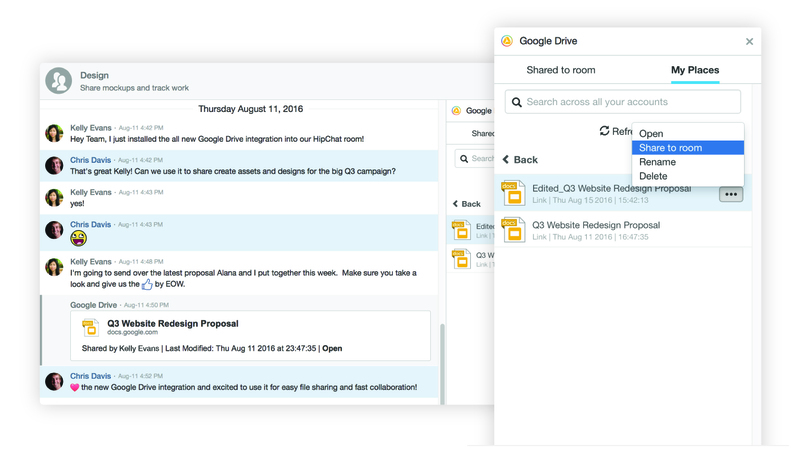 When we started working on the Google Drive integration, we wanted to focus on what was most important — accessibility, shareability, and ease of use. There are many benefits to bringing third party integrations right into HipChat. The Google Drive integration allows teams to collaborate and work together while saving time and eliminating context switching. Being able to access documents, presentations, and files is critical whether a user is at the office or remote. It integrates nicely into the right side bar, enabling users to access, share to the room, and collaborate around important documents, presentations, and spreadsheets. We worked with third party developer Topdox, who was a tremendous partner in bringing this new feature into HipChat. We’re getting great feedback around the speed and simplicity of sharing files without ever having to leave the HipChat application. Why would Google Developers be interested? When we built these integrations, we wanted to give our users a nice balance between out-of-the-box usefulness but also ultimate flexibility in which calendars and accounts a user can view. To do that, we wanted one UI that can display multiple calendars from multiple Google accounts — similar to what most Calendar mobile apps do today, including Google’s own mobile Calendar app. These new integrations were built entirely on top of Google’s API. 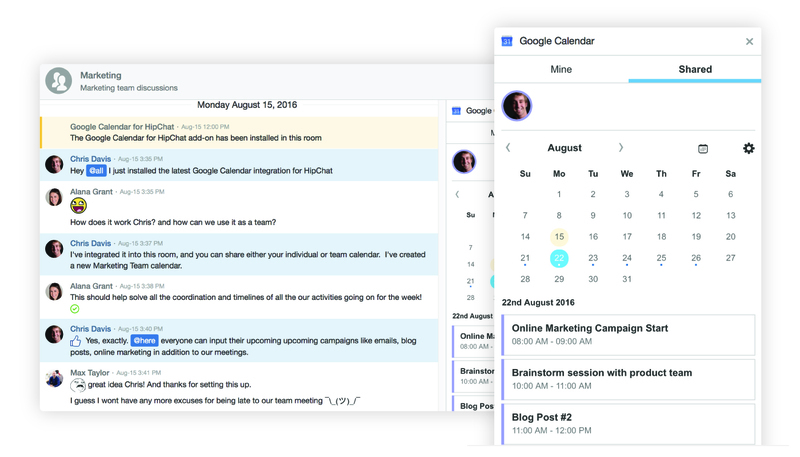 Google’s Calendar API is a full featured API that gave us everything we needed to create a calendar experience fit for HipChat’s users. On top of that, the API was designed with efficiency in mind with push notifications for changes to resources and incremental syncing to improve performance and bandwidth use. Building on top of Google APIs has allowed us to think of new ways to bring even tighter integrations with our products along with the myriad of add-ons built by Atlassian’s ecosystem. One idea under consideration is to link JIRA Software and Google Calendar so that all your JIRA issues are overlayed onto a Google Calendar. Then this calendar can be shared with the relevant HipChat room bringing it all together and enabling teams to get more done. We’d love to hear your feedback on this idea. We think there are many opportunities to improve how teams work together by integrating with Google and Atlassian. You can find out more about Atlassian Connect on our developer’s site and the Google APIs on theirs. 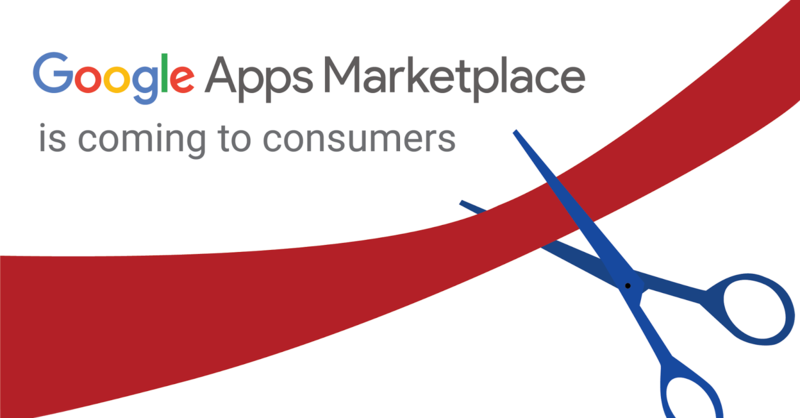 For over 6 years, the Google Apps Marketplace has been the #1 destination for administrators and business users within Google Apps domains to find, discover and install third-party apps and integrations that extend what they can do with Google Apps. First, this change only applies to apps which have opted in to “Enable Individual Install” on the Google Apps Marketplace SDK located in the Developer Console. Apps not enabled with individual install will not appear to consumers, nor will they be installable for them. Second, as a general best practice, we recommend that you do not use a user’s email address as a unique identifier. Email addresses for both consumer and business accounts can be renamed or changed. Make sure to always use the Google Account ID. For more information on sign in and security, please read this. If you have questions or have any feedback regarding this development, please let us know here. We look forward to exposing what you’ve built to our broader community.